There are a lot of boxes and bags of, well, let’s face it, junk. Old paperwork, broken whatever, and “I can’t believe you kept this” type of things. There are quite a few other interesting items I found, as well. Ones that will be featured in future posts, but I decided to focus on more childhood centered finds. This post will focus on those childhood items that brought back fond memories of being young, using my imagination, and not having a care in the world. The first ones I spotted were the old trucks and tractors my brother and I would use on the cities, roads, and farms we “built.” Sometimes we would farm the carpet. Our farming and roads would go all over the living room and travel down the hallway to my parent’s bedroom. My Mom was never thrilled with the marks and lines we made on the carpet but it’s not like they were permanent. We would play for hours inside and outside, with these tractors, trucks, and equipment. We would let our imaginations run rampant concoting a little world of our own. We would create elaborate (at least in our minds) roadways, towns, and bustling life for our imaginary people and businesses. I’ve also written about my love of minatures before, as well. My Dad built me a dollhouse. It is very simple and it’s not very big, but when I was younger and would play with it, in my eyes it was a mansion, and an elegant dwelling for my animal families. In reality, they looked like they were below the poverty level, considering I made all their furniture, and usually out of cardboard or cans. I was creative, and resourceful (that’s my story and I’m sticking to it). The house, presently, looks a little worse for wear and it’s missing the ladder that led upstairs, but I still think it’s quite swell. I not only made the furniture, but I made practically everything that went inside the house. I didn’t sew the little mattress looking thing, but I would find scraps of cloth and rags to use for blankets, and fold them to make pillows too. I’m a huge dork, I even made little books and magazines for them. The Trivial Pursuit game and a set of wooden dishes were the only pre-made items for the house. I searched for the dishes to no avail. I’m sure they’re around somewhere in a box. Then there were the families who would occupy the house. Sometimes they would each take turn living in the house, and other times the bear family with the mom in the green dress were the sole proprieters, and I would use other things as houses so the other families could be their neighbors. The bear son in the striped shirt met with an unfortnate accident, losing his leg. As you can see, there are a lot of babies, they apparently don’t believe in contraceptives. The rabbit family had their child go missing, a serach party was sent out but, alas, it is still an unsolved missing person’s case. And Papa Berenstein looks like he might be the step-father in the other bear family. The My Little Ponies were treasured as a child, they still kind of are. Hopefully they’re not being mistreated by the six year old who plays with them now. They were one of the few girlie things I played with. They bring back memories of watching the cartoon that was on. I’ve seen updated shows with the ponies, and even for me, they were a little drippy and too much in the cheese department. I don’t remember the original being that way, but it probably was. My Mom probably wanted to poke her eyes out with a spoon having to sit through watching it with me. Stuffed animals were some of my favorite toys. I had (have) about 5,722 of them. (Okay, that might be an exaggeration, but there are a lot of them!) Some of them are in California, living with me (I know, I’m a loser). Most are still at my parent’s house where my niece now likes to play with some of them. 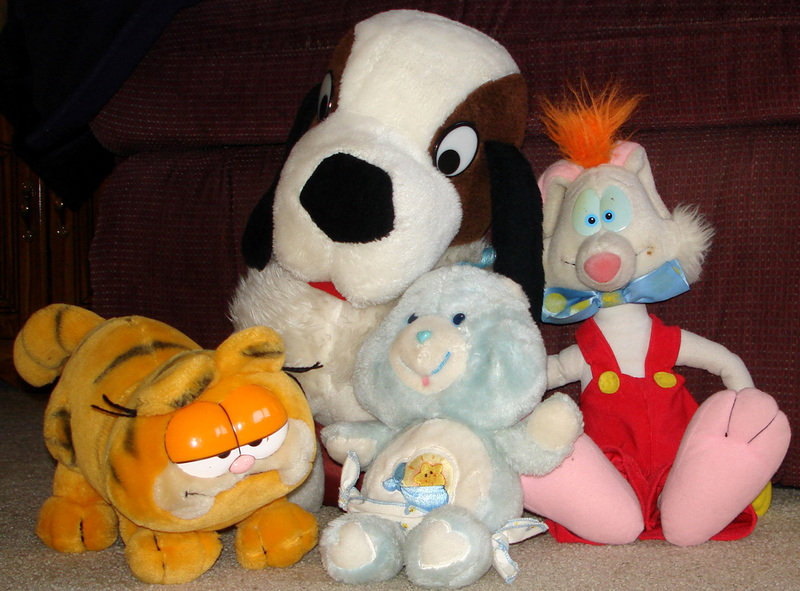 There are Care Bears (Swiftheart Rabbit and Grumpy Bear still live with me), Smurfs (with me), Garfield, Roger Rabbit (love! ), Pound Puppies, a Wuzzle, a Popple, Grover (lives with me), a lot of bunnies (several live with me), and more random stuffed creatures. I don’t know what it is about stuffed animals but they always made me happy as a kid. Maybe it’s the piling them all together where they form a soft nest to cuddle in, or how they always made those scary moments feel safer when hugging them tightly. I also played with small dishes, and would pretend to prepare meals and have teas parties. The pots and skillets would cook delicious meals, and the plates were the best china available. I loved using the the small utensils to stir and serve out dishes. I also had some red goblet looking glasses, which I couldn’t find. I would put real liquid in them, too. Sometimes water, juice, or soda, but I always pretended it was some fancy occasion I was serving them at. I’m not sure why I thought the ironing board was so keen, but I played with it a lot. Come to think of it, I don’t think I ever pretended to iron clothes on it, but used it for other things. I would sit on it and pretend it was a sled, or a jet plan,or just set it up and take it down because it was fun to open and close. Speaking of jets, my brother and I loved to play Top Gun when we were younger. I was always Goose. We had small jets and airplanes. There were little boats. We had stacks of Match Box cars and trucks and farm machinery. We were always driving on the couch and walls, flying all around the house, and I would use the boats in the bathtub. I was very fortunate as a kid, I had a lot of really great stuff. Besides the things I mentioned above, I had a baseball card collection that I relished in. I would be so excited to get a new package of cards with that stale piece of gum in it. Though I would get well-known players, I never got a player that was too valuable, it was still a thrill and so much fun to collect them and organize them in the binders and boxes we had. We had a lot of Legos with which we would construct buildings and bridges for our Match Box cars. It was a challenge to see what we could build that was recognizable. We would try making monsters, planes, and vehicles. Who doesn’t love Legos? (Besides parents who end up stepping on them.) There are numerous other toys I haven’t even mentioned in this post. I’m sure I could do several parts to it. I’m glad my parents have kept these things throughout the years, and it’s nice my niece has a chance to play with the same toys we once played with. I love the feeling that comes with finding them again. Holding them, memories being brought back, and the smiles they put on my face are invaluable. They definitely make the sentimental and nostalgic goo ooze forth in me. Rediscovering parts of your childhood, espcially the ones you can hold in your hands, is a splendid and gratifying affair. ← Where Does All The Birthday Glory Go? It is great you have so many stored memories still today. I wish we had saved something from my childhood, but there is nothing left of it now, except the memories of the Howdy Doody toy with suction cups that would inch down the refrigerator, the View Master reels with scenes from far away places and the baseball card collection of 1950’s baseball cards, that my mom apparently threw away, figuring I had grown out of the baseball card stage. She had no idea those cards were worth hundreds of dollars. I bet that baseball card collection was full of treasures! The things we think don’t matter anymore or toss away just because they seem something we’re past. . .what a bummer. It’s pretty amazing they do, and I didn’t even get through all the shelves in the basement, so who knows what else I could have found! I’ve decided to nominate you for the versatile blogger award, because of your wonderful perspective on nostalgia. I always enjoy reading your posts! Thank you so much! I’ve been terrible about responding to such things, but I really appreciate it! I just read this, sorry it took me so long. I cant believe all that stuff is still at Mom and Dads!! I completely forgot about most of it! They did keep everything!!! I know, and they call me a “pack rat.” You should see how much I didn’t get through! Treasures abound down in the basement, I bet!